Our children just finished up their first full week of the new school year. And although we have worked to prepare them in advance, they are stressed out. All of them. Even the 2 year old knows that things are different, as she has lost her three favorite playmates to school each day and wonders where they are and when they are going to come home. I can see it in their actions and feel it in their little spirits. New classrooms and teachers mean things are unfamiliar. They are already taking spelling tests and writing essays, and can feel the pressures around them to do more and be more. Just like adults, children experience stress. As parents, it is easy to become so busy that we mistake the signs of stress from our children for defiance and misbehavior. 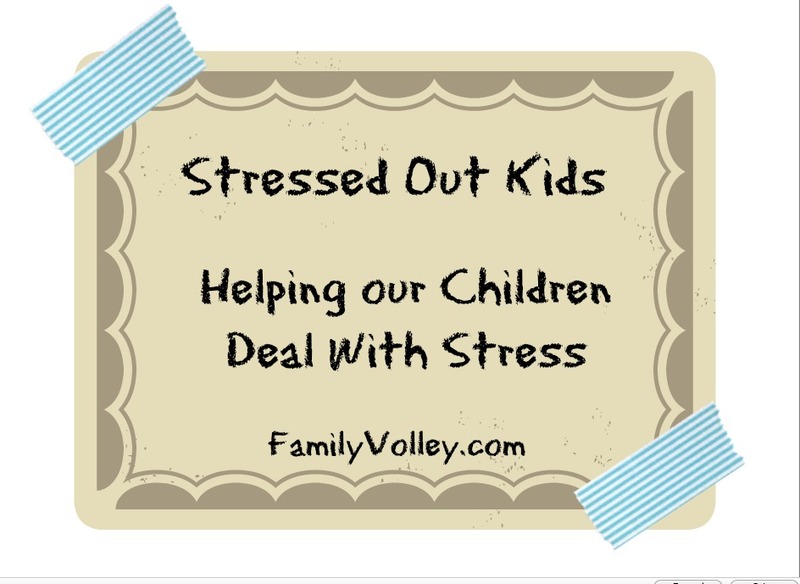 Not realizing that what our children are trying to tell us is that they are stressed out! For our children, stress usually comes from two sources. 1. A situation that is unfamiliar. This might be a new school class, when a parent gets a new job or goes out of town, even houseguests cause stress. 2. The pressure to perform. There are tests at school, competition on the fields and in extracurricular activities, and social pressures to look, dress and act a certain way. Add these together and our children feel pressure from every side to get good grades, score the winning goal, perform the piano piece perfectly AND be class president. Little ones also experience the pressure to perform. "Eat all your food", "keep your pants dry", "share your toys", "go to sleep". Think about how we feel when we are stressed. Now imagine being little, having very limited understanding, and on top of that, not really even understanding what is happening. Not to mention, having very little control. Think of it from your child's perspective and it will be a lot easier to be patient and help them. It will also inspire us to help them eliminate the stresses for them. Our children want to talk to us. They need to talk to us. They want to be heard and to know they are understood. Often times just simply being understood takes away their stress. Plus, when we hear what they are struggling with and worried about, we can talk about it with them and help. But.... to listen, we have to be available. We have to be at the crossroads (when they come and go from our homes) whenever possible and make ourselves available so that when they are ready to talk, we are there to listen. Remember, children talk at different paces. For example, our daughter wants to talk immediately. Our son needs a few days before he is ready to talk about things. I just need to make sure I am available. Just like adults, kids who are active are better able to cope with stresses in life. I know exercise has been a saving grace for me in more than one stressful situation. But in this day and age of technology and video games, kids aren't always quick to get themselves off the couch. So instead of ordering them to "go out and play" or go for a walk, get up and do it with them. Physical activity will make them stronger physically and emotionally. Doing it together will be fun for everyone. There seems to be constant pressure for our children to do it all. Learn two languages, play 4 sports, two instruments and give community service. Even if our kids want to do all these things, it is just too much for them to handle. Good research suggests that kids really only need involvement in one, maybe 2 extracurricular activities. More importantly they need time to play, to imagine, create and spend time with their families. Rushing to get from one activity to another, with little to no down time for our children causes a great deal of stress. Stress that our children don't need. So... take a few minutes to evaluate what your children are involved in and scale back. Instead, schedule time for them to ride bikes, play in the backyard, and make cookies with you. Children don't have the life experiences that we have as adults. They don't always know what they are feeling inside because they don't have past experiences to fall back on as a reference. This is where parents come in. When you notice your children demonstrating signs of stress, we need to help them understand what they are feeling and how to handle it. We need to help them put words to the frustration that is overtaking them. As they have more experiences and time passes, they will be able to pinpoint their own emotions, but until then, we need to help. When we are stressed out, that passes on to our entire family. Especially to our children. Research suggests that our stress could permanently be altering our child's DNA. That is a big deal. Our children are also more likely to be overweight when WE are stressed. From the time our children are just babies, they sense our stress and respond to it. Often times when our young children are struggling to behave, it is because they are responding to our stress levels. We need to take a step back and evaluate our own lives. Are we over scheduled? Do we live stressful lives. If the answer is yes, we need to cut back and get control of things. Our children will handle stress the same way we do, so we must set a good example. Often times our children become stressed because so much of their life is unknown. They enter into experiences not knowing what to expect. We can ease a lot of the stress by explaining new situations before hand and preparing them for what will happen and how things will go. Giving them knowledge will empower them and ease their fears. Less fear means less stress. Once you have explained things, role play. Act out the situations so they can practice what to do. That way, when they are in the situation it will be like auto response for their minds and bodies. Plus, discussion and role play will give them confidence. How do your children manifest stress? What have you found helps them deal with their stress? My 12 year-old (with Autism) has a really hard time with using words. "I'm fine." is his go to phrase. He did admit that he was nervous about starting jr. high, though he couldn't say exactly what he was anxious about. After the first day, he came home and said, "I don't know why I was so worried. It wasn't so bad." We try to talk about their days. I'm trying REALLY hard to turn off my computer when they come home from school so they know I'm there for them. This is a great reminder! I knew they were over tired even though they were getting the same amount of sleep as in the summer, but I hadn't connected the extra crying and tantrums to being stressed out. And boy, are we experiencing a lot of that!!! I'm glad we decided before school started to not do dance this year so we could do basketball. They'll be on the same team so it will reduce the amount of time out of the home. I'm so happy for that! Thanks for the other suggestions, too. Your list describes my 9 year old to a T. Every one of those things is him! It's so overwhelming when our house is a mess and everyone is busy with life. I'll try some of your suggestions and report back.